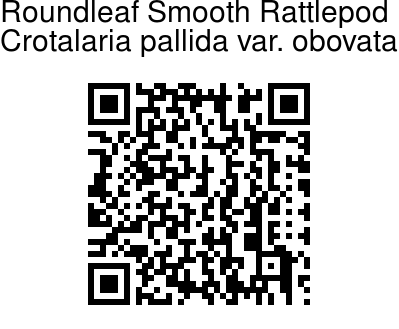 Roundleaf Smooth Rattlepod is an erect, well branched undershrubs, 1-2 m tall, branchlets finely velvet-hairy. Leaves are 3-foliolate; leaf-stalks about 4 cm long; stipules thread-like, falling off. Leaflets are obovate, 3-6 x 2-3 cm, blunt - notched at tip, entire along margin, wedge-shaped at base, membranous, hairless above, glaucous and velvet-hairy beneath; leaflet-stalk about 3mm long, woolly. 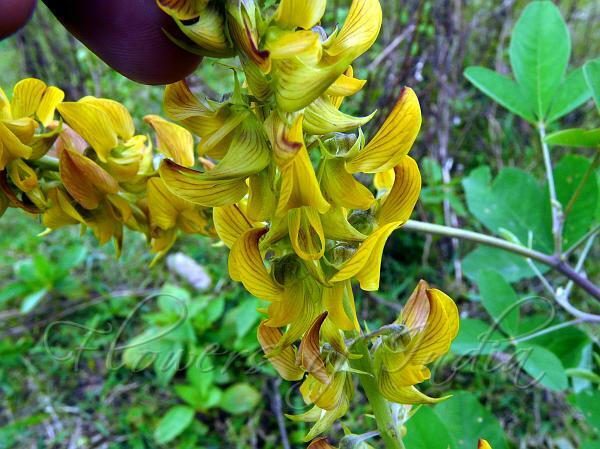 Flower racemes arise at branch-ends and laterally, elongated, up to 25 cm long; flower-cluster-stalks about 5 cm long. Flowers are numerous, 1.0-1.5 cm long, laxly arranged. Calyx tube bell-shaped, about 3 mm long, flat at base and strongly deflexed against the flower-stalks; sepals lanceshaped, 45 mm long, pointed at tip, adpressed velvet-hairy. Flowers are yellow with purple stripes, twice as long as calyx; vexillum yellowish-purple, oblong-elliptic, about 1.2x0.8 cm, blunt-rounded at tip, claw about 3 mm long; wing petals elliptic, about 1.0 x 0.3 cm; keel petals sickle shaped, about 1.2x0.5 cm, fringed with hairs on both margins. Pods are oblong or nearly cylindric, 3-4 x 0.6-0.7 cm, with a short stipe, sometimes slightly curved, becoming hairless. Seeds 4060, kidney-shaped, about 3x2 mm, brown. Roundleaf Smooth Rattlepod is found in NE India, Gujarat, Goa, Maharashtra, Karnataka, Kerala, Tamil Nadu, Madagascar, North and South America, at altitudes of 200-1370 m. Flowering: all year. Identification credit: Sangram Sonje Photographed in Relli River, Kalimpong, West Bengal.